The east, west, and north walls, along with the roof, are sheet metal. The front, south-facing wall is expanded metal (think chicken wire on steroids). This allows lots of air movement, keeping the environment nice & dry. With the opening facing south, that also allows the sun to enter and warm the coop in the cooler months while, with the summer’s sun being higher in the sky, much less sun enters, allowing for more shade. When we get a few warmer days, we’ll scrub the accumulated dirt from the sheet metal and paint the front wall to look nicer. The interior will have a half-wall sheeted to keep out the accumulation of crud. We still have to make a good nest box but, for now, buckets will do. They have one simple 2 x 4 for their roost but we will expand that as we get more birds in the spring. We did manage to bring the cool feeder Steve made from Oklahoma. And see the pumpkin pile? Yummy (and free!) chicken food! We’re giving them a few days to have fun eating up the grass and its bugs. Once they’re through with that, we’ll throw in corn stalks and leaves for some fresh fun & bedding. That coop is awesome! I wish ours was that nice! That’s just wicked. I’m totally copying this. We need a new coop for the spring, and have been tossing around different designs, but this one will work just perfect. Simple, easy, cheap. The goat and the chickens refuse to be separated so I need to have something that will accomodate them all. I’ll have to winterize it, but seems way easier to do with this design than other ones. Hell, I can just do removable panels for the front…okay, now the brain’s working, thankyouverymuch, if only the foot and a half of snow would melt. This is me, hollering. Most of the books and plans I’ve seen just wouldn’t fit my surroundings or my budget, or the temperment of my poultry. My brain has been working 90 miles an hour since seeing your new coop. I can even see replacing the ducks we lost to the fox last year. I’ve held off on raising new ones, because our current coop can’t accomodate them safely enough and any new plans I’ve looked at seem to need a thousand bucks and a doorman. I greatly appreciate you sending me the book. I’m completely sold on the open-air house now. AND, I don’t have to winterize it at all. That’s the coolest part. I’ve talked to a lot of naysayers, who are convinced this will never work in our winters, but after reading this, I think they’re wrong. Looking at my current coop, I can see all the sunlight that’s getting blocked by the southern wall, and to be honest, all my chickens are currently perched in the window. You’ve made me rethink it all, and that’s awesome. The more I read through this book the more perfect this becomes. Thanks Diane. No prob. I’m glad to have a cohort of sorts in this little experiment. I’ve heard nothing but doubts from others so far but I don’t think any of them have researched it much. I’ve read up on this thing for years now and my gut says it’ll work. Do please keep me updated on your end of it! Can I get a copy of the open-air chicken house book? I just got home and am about ready to crawl in bed. Please remind me if I don’t email you in the next couple of days, okay? Okay, it’s sending now. Just holler if you don’t get it and I’ll resend. Good luck! Can I get a copy of the book as well? Thanks in advance. It’s sending right now. Let me know if it doesn’t go through, okay? Good luck! Not many details in that post, but I’m hoping to a get a chance to post a “tour” when it’s completely finished. Soon. Maybe. Before next year. Oh, and I stole a pic from your blog, because, well, you were the inspiration and I needed a pic for demo purposes! Yes! So freaking cool!!! I’ll hop over there and holler at you tomorrow. Oh may I please have the book as well? I’m in the process now of building a coop and I totally think this concept makes sense! I’m hoping to raise meat chickens. It’s sending right now. Let me know if it doesn’t come through. Okay, I need a copy of this book too – is it too late to get a copy? Sending right now. Holler if it doesn’t go through. New to all this! I have a wooden doorless garage with metal roof completely empty just begging for help. I’ve wanted chickens for a very long time but never thought the garage was good enough space for them. Also I don’t really have the means to do a large runner for my future flock… any advice is great. Can I let my chickens roam free? I live in at the end of a neighborhood street, will the chickens go into my neighbors yard? They already hate us for tilling up our yard to garden… :/ Advice, advice, advice! May I get a copy of your book? Thanks in advance. Just to clarify, it’s not “my” book. It was written long ago by a fella. I’ll email you about that in a minute. Hi Diane – I was just talking to my husband about open air coops and it was great to see yours! We are in Michigan and gearing up for some chickens. I would love to check out the book that you referenced so we can make sure we do this right (like having the open side face south). Would you be willing to share that with us? Thanks for the inspiration! I just emailed you. Holler back if it didn’t go through. Hi Diane, Great coop! could I please have a copy of the book? I emailed you, Mark. Let me know if it gets lost in cyberspace. Hi Diane! Love your coop and hoping to build one similar in the next few weeks. Could you send me a copy of the book as well? Thanks so much. Shot ya an email, Shane. Let me know if it doesn’t get through. May I have a copy of the book as well? We have a coop that looks very much like this left by the previous owners but there is no front on it. The front is open to the run. Thank you! This is so brilliantly simple! We have been talking about getting chickens for a couple of years now, but this design is what will actually get us to the commitment stage. Could I possibly get a copy of the book, please? Thanks! I have just heard of open air coops and am really interested. Would it be possible to get a copy of the book? I love your coop. 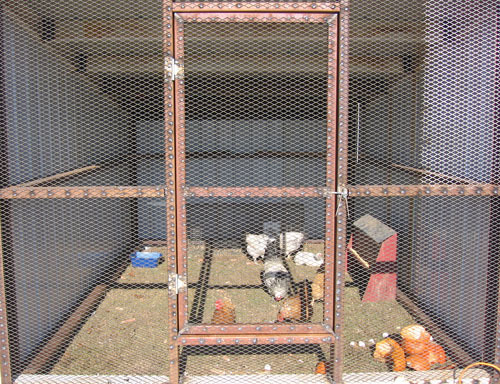 It is so simple and more healthy for the chickens. Let me know if you don’t get my email, Tammy. Diane, I think this is just what I need for our hot inland valley in SoCal. I’m afraid any coop I make with 4 walls will suffocate the poor chickens. Our local feed store has a few birds that they keep in something similar to this. Could I possibly get a copy of the book also? Pam, did I ever get around to emailing you? Please let me know if I did not. Sorry, I neglected my blog most of the summer! This is great! 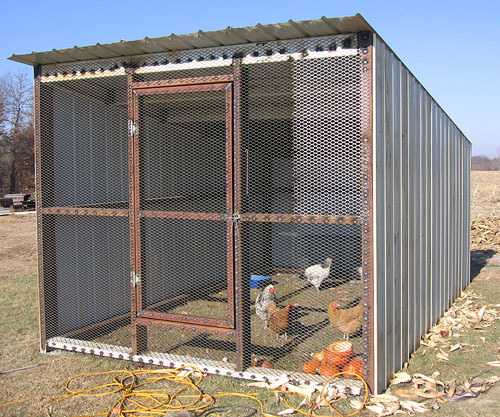 After reading the open air chicken coop book, I’ve been trying to decide on a cost effective and attractive coop plan. How much did materials cost for the sheet metal? Nice work! We paid for nothing, other than the concrete floor. My husband is a welder so we just used scrap he had piled up. I’m lucky, I know! I’m not sure what the current pricing is on sheet metal but it’s not terribly expensive. Good luck with your coop! hi, I would also love to get a copy of the book. Any updated photos of your coop? Anything you would have done differently? Any particular part that was genius;) gathering as much info as possible! Julia, I also sent you an email. Let me know if it doesn’t make it. I sent you an email. Holler back if it didn’t get through. Hi Diane, so now that you’ve had this coop for 4 years how is it? Any problems with your chickens, the cold, predators, anything? Ive found a pdf of the book online so Ill read that. We have had no problems whatsoever with it, other than the occasional mouse setting up house in it for the free food which can happen in most any coop. Thanks! One last question, do you cover the open air side at all during the winter? I read some varying opinions. I realize this post is pretty old, but I have a question. 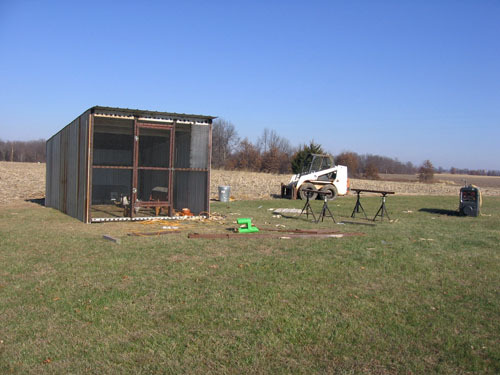 I live in Western NC and am planning on building an open-air chicken house (3 sides and a roof) similar to what you have. Folks around here are saying “it’s impossible” because of the cold. For example, it’s suppose to get down to 5 in a few days. I can’t help thinking cold-hardy birds would be fine . . . then again I wonder. Do you have troubles come winter? Do you cover the front at that time? Thanks so much!! Yep, I can imagine the “not nice things”. Common sense tells me the birds would not only be fine, but better off without a cover. Being totally new to chicken ownership–still in the planning and building stage–all the experienced folks gave me pause. I’ll stick with the open air idea–it just makes so much sense to me and, well, it feels better. Sounds like you don’t have trouble with drafts either. That’s one thing I’ve read about that gave me pause as well. Thanks for the prompt reply. I’ll have to check out more on this site.